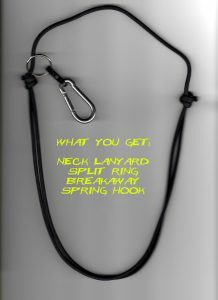 The New Self Defense tool neck lanyard! 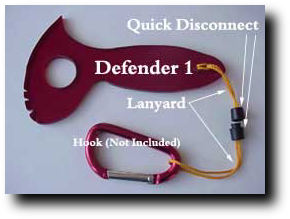 It was about time that I got a solution to our neck lanyard problem for the self defense tools. What was the problem? Well in the past we had a really nice elegant solution…that was a kydex holster that fit the digit capture hole in the defenders. Now only certain models had that feature .i.e., Defender 1, Defender 2, Owl, rabbit, Spec ops 2, RP defender, and the Ronsonator. The others were not usable on the neck lanyard. The holster design was very nice and worked extremely well. However, the person that did them had to stop. He sent us his mold but I couldn’t find anyone who could make them! A bit of talent I presume. So I looked for years to find someone that could step up and make them. In trying we lost the mold so we just didn’t get anywhere with them. So, with lots of trials and failures; I centered on a design that I think works. However, I’m the first to say it isn’t very elegant! But it’s functional and now we can carry our defenders, once again, around our necks for quick deployment! Great for traveling in a car as it’s always handy and ready for service if you should need it. 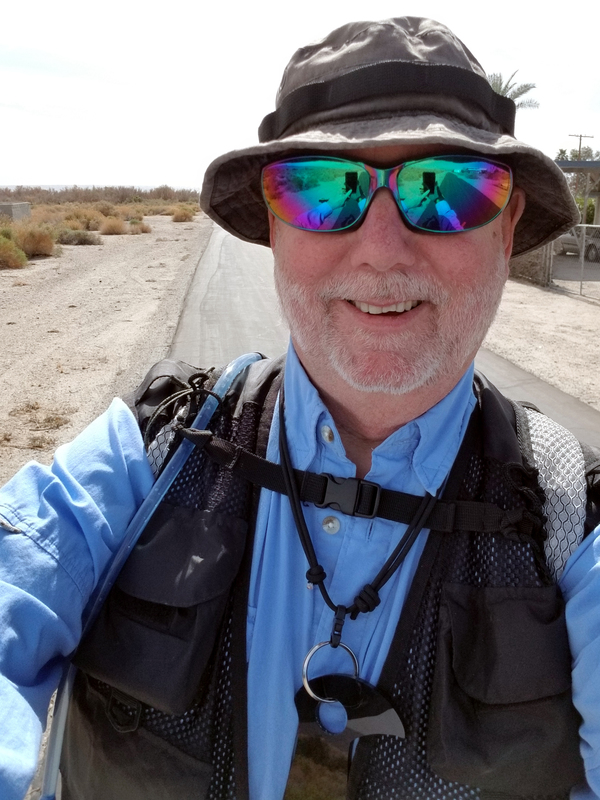 Also since I’m doing a lot of hiking these days I wanted one to travel with me into the desert where things are very unruly. There were even two people a few years back attacked by a pack of dogs out here and one died! So, I wanted a very aggressive tool to follow me on my hikes. Me with my defender Neck Lanyard. of us want which are things that have multiple purposes. I tend to hike in the late afternoon and hike heading West into the sun. Once the sun is down behind the mounts I take my sunglasses off and put them through the split ring! I like this multipurpose use so I included it into the final neck design. One of the things I needed to do was to find a new quick disconnect as the standard one we have doesn’t integrate with a neck 550 cord approach. When I first looked at how to carry a defender back in 2004 I looked at the badge industry as they seemed to have lots of possible solutions. We still go with the standard lanyard today for many things. One feature I wanted from the new neck lanyard approach was to be able to carry any of our self defense gadgets. With the new design, we can accept any of the self defense tool via the small holes at the end of the handle. Couple this with the new side lanyard design you can use the new 550 cord quick disconnects to integrate a solution into the new neck lanyard design. This is how the new neck lanyard integrates with the new side lanyard design! 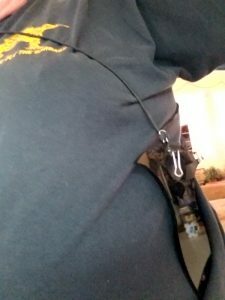 The new neck lanyard can become a shoulder holster lanyard too! 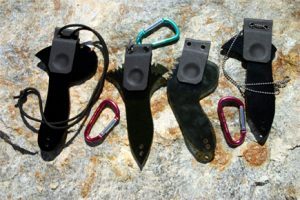 As you can see with the picture to the right, you can have your everyday carry using the new side lanyard and the 550 cord quick disconnect to be put on the new neck lanyard. 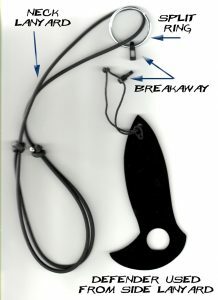 This opens up the ability for us to carry ANY self defense tool on our neck lanyard. But wait there’s more! Haha, yes there is more as I make the new neck lanyards so you can expand the lanyard to work like a shoulder holster. That is, you slide it all the way out then put your arm into the neck lanyard then move it under your arm. 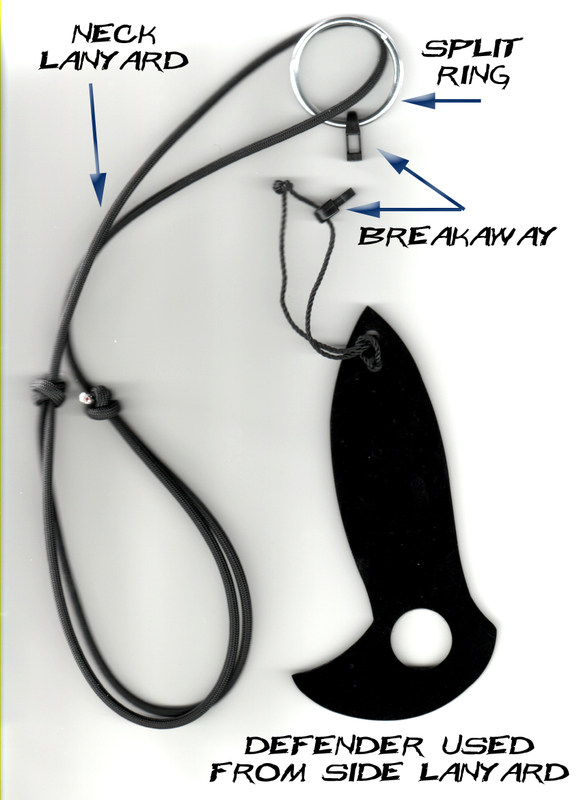 It makes a very handy shoulder lanyard so it gives you even more options for concealed carry requirements.